Sweet 16 Farm’s first wonderful year has come to an end. We are very grateful that our open gate brought to us so many kind people. Praise for our tomatoes, for our produce displays, for our efforts, and the delight expressed for the beauty of our bouquets! This was the beginning that we had hoped for. This has been our whirlwind seasons of smiles, hard work and lessons learned – The weeks went by so fast that it is only now as we prepare for winter that I am able to look back, reflect, and be amazed by all that we accomplished. From spring’s Mother’s Day Weekend Plant Sale, to summer’s harvest of peppers and tomatoes to the last cuts of zinnias for our fall bouquets, words can not express how proud I am of my family and how thankful we are to be a part of this community. Each week our farm stand brought us new friends, great conversations, and endless notes and suggestions overflowing the pages of my 2016 Garden Log. With the garden now tilled over, and next year’s garlic snug in the soil we have turned our attentions to next year and our immediate need for expanded greenhouse space. If any of you followed us on Facebook this spring, you will be familiar with the 9’x9′ growing space I called home from March till May. I often joked about how I invented “Greenhouse Yoga” with all the slow, focused stretching I performed to avoid catastrophe in the remaining 1’x3′ maneuverable space. Staying in tune with our sustainable farming model, we decided to repurpose an existing structure rather than embark on a new build, and with the 24’x24′ milking parlor already equipped with electricity and running water it was the obvious choice. With the warm fall days lending themselves well to checking items off the wish list – our new growing space is well underway. 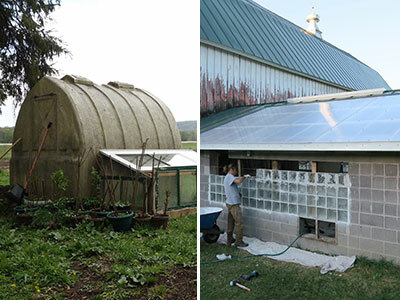 A new polycarbonate roof has been installed and thanks to a few craigslist ads we were able to source enough glass block to transform the south facing cinderblock wall into an additional light/heat source. As a farmer, this new space excites my mind with all its endless growing possibilities, and as an artist, I cannot wait to see all the photographs this light room inspires. Looking forward to having a bit more time to blog in the slower winter months – until next time. Next Article: Our First Promotional Video!